The Gate of Imperial Supremacy (Huangji men) is the front gate for the Palace of Tranquil Longevity (Ningshou gong) compound. It was constructed in 1771, the thirty-sixth year of the Kangxi reign reign (1662-1722). 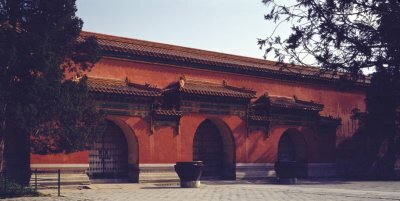 On the opposite side of the Gate of Imperial Supremacy sits the Nine-dragon Screen (Jiulong bi)—a large glazed-tile screen wall. Squares are opened up on both sides of the gate. Northward across the square situates the Palace of Tranquil Longevity. Evergreen pine trees and cypresses are planted along the east and west sides of the two squares. Consisting of main arch, secondary arches and side arches, the glazed gate was constructed in an archway style. Functioning both as a gateway and as a screen wall, it serves as an architectural transition connecting the Nine-dragon Screen in the south and the Palace of Tranquil Longevity in the north. Its grand momentum, unique structure and exquisiteness render it the best glazed gate in the Forbidden City.